At the Top of the Pyramid is a title that anyone hat has been through high school will be able to intensely and completely understand. The film focuses on those issues that are deep in the psyche of all teenagers, including feelings of belonging, depression, and an overall mis-match between what one feels and sees in the mirror. The title focuses on Jamie Parker, a beloved member of the high school that takes a tumble from the top of a cheerleading pyramid; the resulting fall is replicated in her fall from grace. With the sheer amount of taunting and disdain that she experiences, Jamie has to change schools and attempt to recreate her happy life. When a major life change brings Jamie back to the school that caused such dangers to her psyche, viewers of At the Top of the Pyramid will see this teen rebuild and become much stronger as a result. 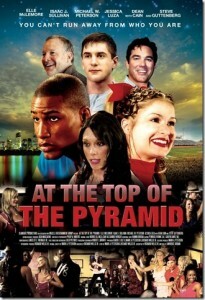 The film succeeds based on the strength of the cast; Dean Cain and Steve Guttenberg are the veterans here while Jessica Luza, Michael W. Peterson, Isaac J. Sullivan, and Elle McLemore round out the faces seen in At the Top of the Pyramid. At the Top of the Pyramid possesses a killer soundtrack that both recreates the high school experience while breaking big some up and coming performers. The film will be available On Demand, Pay-Per-View and on various cable stations shortly, so make it a point to keep an ear firmly on the ground for when the title will be available for you to see. For fans of Mean Girls, Bring It On, or Save the Last Dance.